This article is a combination of the research of Frank Watson, moddsey, David Bellis and Hugh Farmer. Frank Watson has been reading about the Plague outbreak in 1894. There is mention of a “Glass Works Hospital” which had been hastily converted from a glass works factory. He thinks this may may have been in Kennedy Town. Can anyone confirm this, provide the exact location and any further information? “moddsey” through gwulo.com suggested that the location of the Glassworks was on Victoria Road just up the slope and past the end of Kennedy Town. “moddsey” adds that there is a photo of the Glassworks, circa 1898, on p73 of “City of Victoria” pub Urban Council. David Bellis through http://gwulo.com/node/15673 has found an 1897 Map (UK National Archive reference MPHH 1-412) which shows a ‘Glass Works’ between Davis Street and Cadogan Street in Kennedy Town. Hugh Farmer: However, moddsey’s location and David’s are different and it is unclear whether there were two ‘glassworks’ in the area or whether the building in moddsey’s photograph was used for a different purpose. This map shows a Glass Works in a block bounded by Belcher’s Street, Davis Street, Forbes Street and Cadogan Street. As indicated below by this date the company had already closed down. A long article on the Hong Kong and Macao Glass Manufacturing Company Limited in Kennedy Town is available in the Hong Kong Daily Press dated 9 January 1886. From newspaper records, the Glassworks did not last long. By 1889 the Company had closed down and reclamation was taking place on the foreshore in front of the Glassworks. 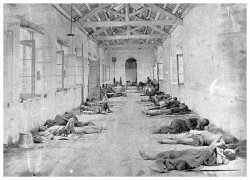 On 20 May 1894, the old Glassworks was used as a temporary plague hospital. The Glassworks will externally be seen to be a large rectangular 2-storeyed building some 220 feet in length by about 110 feet in breadth, having a boiler-shed, and chimney shaft attached. The 2-storeyed buildings referred to are some 16 feet in width and are thus made to enclose 3 sides of a parallelogram or space in the centre open to the air. The western side is bounded by the glasshouse proper, a square building, from the centre of the roof of which is seen projecting the tall cone previously referred to. That matches the layout shown on the maps, though the cone chimney isn’t visible by the time the 1920s photo was taken. This article was first published on 20th December 2013.